Alabama Mike is a hard-driving Chicago style blues singer with the ability to make you feel as if youve revisited the early CHESS RECORDS days. Alabama Mike is a force on the microphone with that first rate, church house tenor, that he was blessed with he has a sound that will remind you of a young BB King or Buddy Guy, Elmore James and Little Johnny Taylor. Michael A. Benjamin, aka Alabama Mike was born January 31, 1964 in Talladega, Alabama. He was influenced by the gospel singing of his father who encouraged him and his five siblings to begin singing in the church at a very early age. He came to California in 1983 via a military hitch in the U.S. Navy which landed him in the San Francisco Bay area. Several years down the road, as he soaked up what he could learn from blues records he collected and local blues act and associates along the way, he started performing the blues professionally in 1999. He was fortunate enough to put a record label (Jukehouse Records) together in 2009 along with co-founder Scott Silveira and released his first record entitled Day To Day which officially broke him into the blues music scene. Domestically and internationally known for his first rate tenor vocals and his witty and ingenious song writing skills, he then followed with his sophomore offering in 2011 which he entitled Tailor Made Blues that has been causing some fuss around here, garnering five star reviews in all the major blues magazines and heavy airplay worldwide. His band includes Anthony Paule ~ guitar, Scot Brenton ~ guitar/harmonica, Kedar Roy ~ bass, Paul Revelli ~ drums. He recently formed a acoustic blues-trio calling the The Hound Kings, which includes himself, A. Paule and W.S. Brenton. The Hound Kings have released their debut cd May 2013 entitled UNLEASHED. 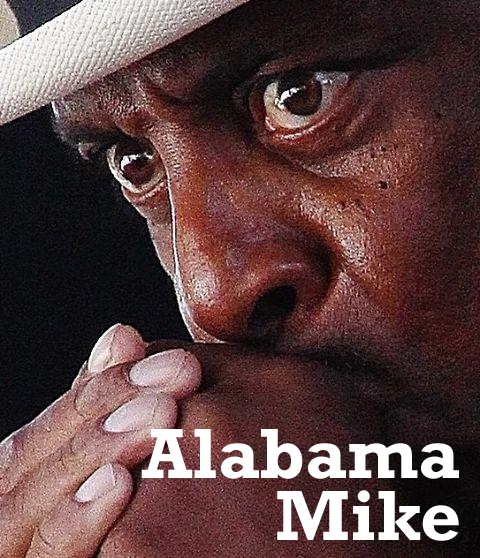 Alabama Mike has shared the stage with such blues greats as The Fabulous Thunderbirds, John Primer, Lurrie Bell, Steve Freund, Bobby Rush, Johnny Rawls, Fillmore Slim, R. J. Mischo, DeWayne Wiggins, Willie (Big Eyes) Smith and so many others. He has also played several national festivals and concerts including the Poconos Blues Festival, Reno Blues Festival, among others and is preparing to tour internationally this Summer 2013. He has previously been awarded 2010 Blues New Artist Of The Year ~ Bay Area Blues Society, 2010 Nominee Blues Blast Magazine Beat New Artist Debut Recording, 2011 Nominee Blues Foundation ~ Category:Blues Music Award Traditional Blues ~Male Artist Of The Year.